Can I Buy You Coffee? I love helping startups! I think I overcompensate for not having found very many mentors when I started my first startup, and I wish I had asked more questions before launching my first company. To state it better, I wish I would have known which questions I should have been asking before launching my first startup. So, living in Seattle and working with startups, I drink a lot of coffee. 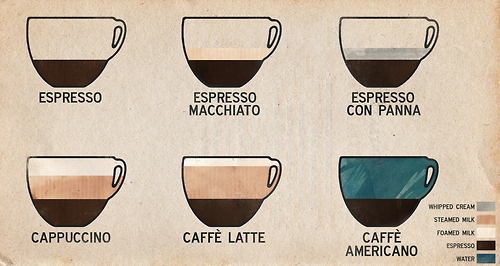 My favorite is simply two shots of espresso with whipped cream – a doppio con panna. There are three types of people you will engage in these meetings. Mentors/Advisors/Entrepreneurs – these are the “been there, done that” crowd. They can best help you by providing advice on the lessons they’ve learned. Though not typically investors, they might invest, and they’re usually good for a meeting or two of advice. After that, if you found value, you may want to engage them with stock incentives. Investors – these can be Angel or VC. Both have different investment profiles, industries and stages. These are usually good for a meeting or two. They will want you to show progress between meeting. Promoters/sales people – those that see what you’re doing as cool and want to promote your deal for a fee or want to sell you something. More on them here. I’m in the first category. Working with the UP Global (Startup Weekend) allows me to do some of this activity in a group setting vs. 1:1 meetings. Tell them your idea – with clarity and passion. You don’t have to use slides, but if you do, make sure it’s <10. Tell them the problem you’re solving and the uniqueness of the solutions. Tell them why you and your team are the people who will win. Tell them about your market traction or if it’s early – why you think you’re going to have market traction. Ask what they think – then shut-up and listen. Ask if there is an area where they would be interested in helping you. If you have a specific request, ask (with the below exceptions). Don’t ask them to sign a Non-Disclosure Agreement – your idea isn’t that good and professionals won’t sign it. They’ll just talk about your rookie move after coffee. Don’t expect them to do the work for you. When you send a follow-up email with your executive summary, make sure it’s simple enough for them to forward along, not something that they need to edit to make relevant or is so long they’d be embarrassed to forward. Don’t ask for Investor referrals – you just met them and you’re going to need to do the work to prove that both you and your idea are credible. By the way, if they are excited about investing in your idea – they will tell you and they will be happy to make introductions. By the way… before you ask for the second meeting, go and do the things the person asked you do at the first meeting: read the book, do the research, meet with prospects, ship a product… you get the point. Love this Dave! A great cheat sheet. I am running the 2013 Business Plan Competition at The Entrepreneur Center (TEC), University of Washington, Bothell. Hi Dave. Can we buy you coffee? Hi. My name is Cynthia Holcomb and I am the Founder of Prefeye. You met Stewart Kirchmeier last night at the Business Model presentation you presented at Perkins Coie. Stewart gave me a debrief and I would love to meet you, show you live product, and overview of our rev model….and then listen and learn from you. We have applied for 9 Mile Lab. I heard you speak before I pitched at the Kick Demo Day last week. I’d like to connect and discussing partnering. I direct the Prison Scholar Fund and we provide funding for incarcerated students to pursue postsecondary education. We’re exploring a pilot program in a Washington prison where we’d prepare inmates with full stack tools, then help place them in industry employment or incubators post-release. I’d love to explore way we might work together (Code Fellows satellite program, best practices, transitioning, etc.). If this sounds like your cup of tea, the doppio con panna is on me. Thanks Dirk, looks like I’ll buy lunch and you can buy coffee next time. Great Dave. I see what you’re doing… and I like it. Hi Dave, great to see you last week. I loved the Seattle 6 month startup – Ideation to Revenue program. Although Corrio is well on its way with paying customers from across the county, I am really glad I attended the 3rd session. I am preparing for a raise at the end of summer so I’ll be there for the next 3 too! Can I buy you a doppio con panna? We met at the Seattle Tech start up week, I would love to tell you more about my business plan and appreciate your advise/feedback for my business model and execution plan.